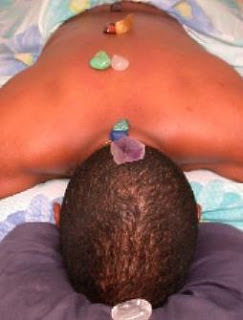 Crystal Healing, as seen on the reality tv series The Hills, is the belief that crystals can be used to heal the body, guard against negative vibrations, smooth the energy flows of the spirit and the body, transform the spirit, and inspire intuitive insight. This is said to be possible because of the power that can be found in the crystal's structure that is a conductor of energy as a transmitter and a reciever (crystal cure). The earliest records of crystal healing comes from ancient Egypt where the Ebers papyrus states the medicinal uses of many different gems. Healing with crystals is also recorded in India's Ayurvedic records and in traditional Chinese medicine from around five thousand years ago (health). Crystals have been used as a sacred object for thousands of years carried in pouches in order to guard negativity or even buried with the dead (crystal cure). This belief continues today among New Age healers who use crystal wands in order to heal auras in aura therapy. Overall, most scientists and health professionals believe crystal healing to be psuedoscientific quack therapy. There is no scientific evidence that concludes that the energies found in these crystals can provide any type of healing or protection from negativity; all we have are testimonials that simply say crystals work for them, which make the placebo effect a possible explanation for any occurences of the crystal's "magical powers" (skeptic). A television show reporting on Britney Spears said that she pays thousands of dollars for a type of crystal therapy to alleviate any wrinkles and signs of aging. Apparently it "worked." This is so interesting. The subject seems fairly familiar but I never really heard much about it. I can't believe people actually spend money on it.